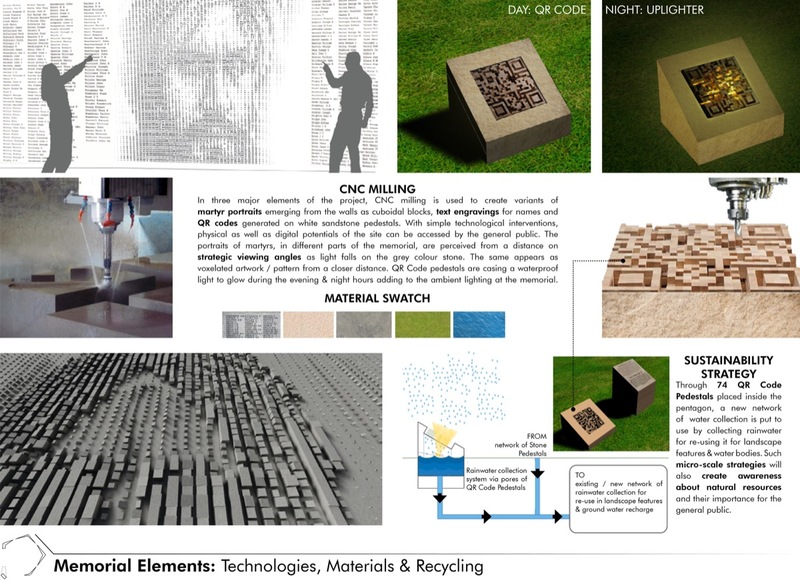 rat[LAB] Research in Architecture and Technology participated in an International Design Competition proposed for the design and implementation of a commemorative National War Memorial which was organised by the Ministry of Defence, Government of India in order to honour the memory of all soldiers and their sacrifices. 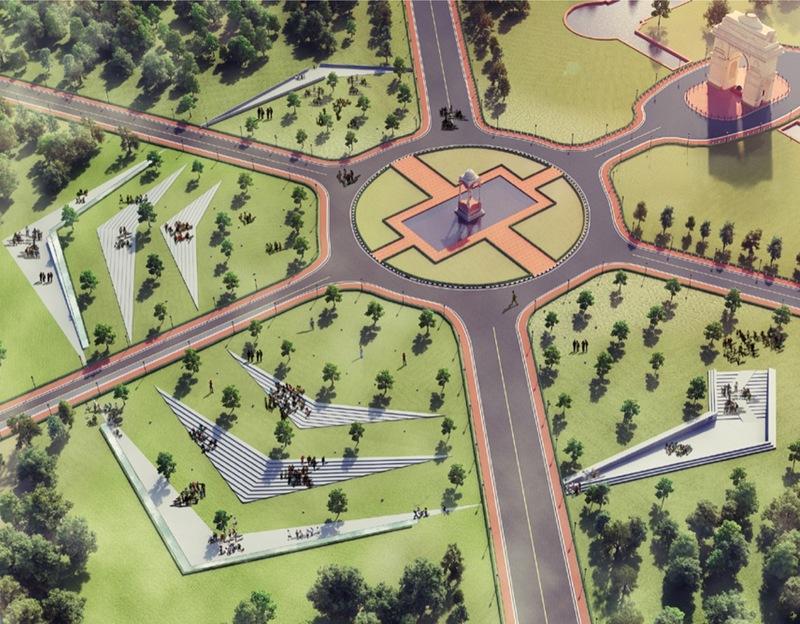 The Memorial is envisaged at a central location in the national capital as a structure and space depicting the solemnity of the purpose. As a tribute to the brave, it would combine architectural aesthetics and public sentiment, and serve as a place for people to show their respect for the soldiers for their extraordinary efforts to protect the nation. With innovation and technology at the forefront of our design conceptualisation and development, the project did not limit to a mere physical space. The selected site is located in the heart of New Delhi, within the C-Hexagon of New Delhi and lies in the close vicinity of India Gate and Chattri. Wars leave a huge impact on any country with respect to economy, growth or on human grounds. India has seen 5 major wars since its formation as a country along with numerous other peace-keeping missions carried from time to time. We have lost precious lives of about 25,000 brave soldiers in these missions which have left scars on the face of this country that may never be healed. Through this design scheme, we are commemorating these brave hearts through a symbolic representation of wars as SCARS on the face of the earth. Four Vertices have been strategically planned within the site constraints of Lawn I, II, III & IV of the famous hexagon around India Gate. India Gate, as it casts its last shadow before sunset towards north-east on 16th December at 1830 hrs, is perceived as the Fifth Vertex to form a ‘perceived’ closed polygon and subtly adds a new geometry of a PENTAGON in the heart of New Delhi. Four vertices are a metaphorical illustrative of wars of 1947-48, 1962, 1965 and 1971 (in order) while the fifth one is a symbolic of the most recent war of 1999 overlapping with India Gate which commemorates 13,218 warriors. The official date of surrender of War of 1971 is taken as an important date in the history of India and is used to celebrate the ‘Closing of the pentagon’ to be interpreted as ‘No more wars’. Pentagon, as a geometry, plays in integral role and remains open and porous throughout the year with a highly perceivable footprint in an aerial or satellite view with its sharp vertices, as it stands in contrast to the lush green hexagon. With the evolution of technology in the 21st century, it would be ignorant to not seek tech potentials and limit this memorial to a physical space only. Taking this idea forward, a virtual platform & database of 25,000 soldiers has been created which can be accessed using QR codes that emerge out of CNC milled sandstone modules laid inside the pentagon area. These are aligned towards The Canopy as its central focus, along with textual engravings on pedestals. 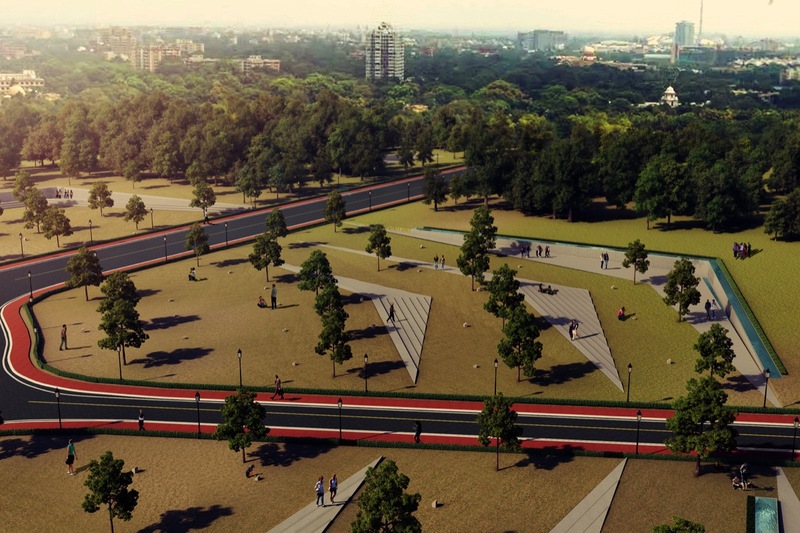 This accentuates the axes within the site with a secondary axis that visually passes through India Gate, Scar of 1971 (Lawn I) and The underground tunnel entry towards the proposed Museum. The first vertex denotes the scar of Indo-Pak Conflict of 1947-48, and is strategically placed in the constrained site of Lawn IV with two edges aligned towards India Gate on the west and towards Lawn III on the east. Key spatial characteristics: Fragmentation of walls to control porosity & circulation; Infinity Walk towards east. The second vertex denotes the scar of Sino-Indian War of 1962, and is placed at the axial mid-point to balance the spatial character of Lawn III while the landform surface is pulled up and down (1.5m) to give subtle slopes thereby creating a wall facing outward. Key spatial characteristics: Sloping of landform along edges & vertex to create an outward facing wall; steps to add a visual & functional character towards The Canopy. The third vertex denotes the scar of Indo-Pak War of 1965, and is placed at the axial mid-point to balance the spatial character of Lawn II while the landform surface is pulled up and down (1.5m) to give subtle slopes thereby creating a wall facing inward. Key spatial characteristics: Sloping of landform along edges & vertex to create an inward facing wall; steps to add a visual & functional character towards the wall. The fourth vertex denotes the scar of Indo-Pak War of 1971, and is placed at the axial mid-point to balance the spatial character of Lawn I. The scar is asymmetrically designed and has a gradient of sloping ground at both the ends. While the east side is merging on a point meeting the landscape as two walls converge, the west edge is a chamfered end to align to the axis with India Gate. Key spatial characteristics: Steps & Ramp to accentuate axis line with India Gate; Merging of ground on east with landform to allow circulation; Steps towards outside of walls to encourage seating. The fifth, and the most strategic vertex denotes the scar of Kargil War of 1999 and is indicated by the exiting India Gate monument. No physical intervention is made (as per guidelines) yet a part of the context is brought into the memorial design as a ‘perceived inclusion’. This, virtually, closes the series of wars by forming an irregular Pentagon with The Canopy at the centre. Key spatial characteristics: No physical intervention; inclusion as a vertex / scar in the parallel ‘digital / virtual’ interface designed for SCARS OF WARS. 8000 sq. ft. of wall area 25,000 names11 wall surfaces16 portraits 30 QR Codes. Although all scars or vertices broadly denote individual conflicts or wars, details of about 25,000 soldiers are placed clock-wise in an alphabetic order with their number, ranks, name & units, starting from Lawn I in the North (and moving towards Lawn II, III & IV). Portraits of some of the significant soldiers are subtly designed over the wall surfaces to break the monotony of engraved names, in parts. These appear out and are perceived from various viewpoints and distances, as per light and shadow conditions. 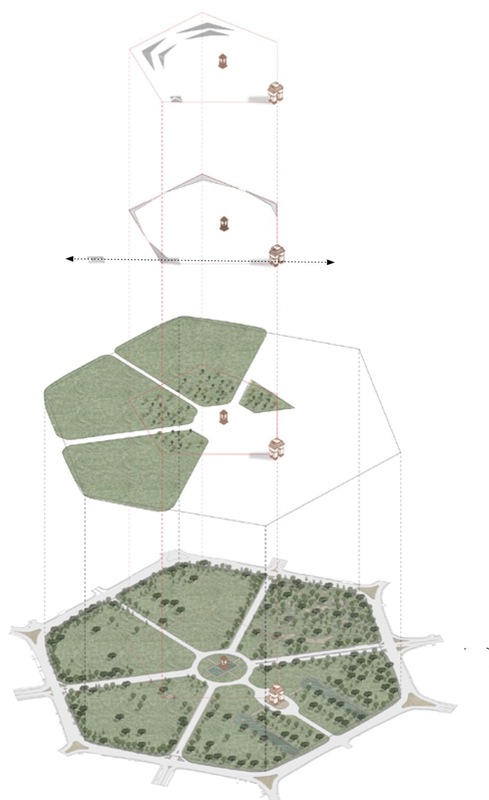 Closed polygon and axes have been an integral part of planning of Luteyns’ Delhi, and has, over the years, created a mental map of Delhi with Hexagon at a focal point of orientation. With the usage of digital satellite maps in today’s times, these polygons and axes have become even more powerful to project perception of the city at an international level. 3 sided polygon: Triangular geometry of roads / axes being formed between India Gate, Rashtrapati Bhawan and Connaught Place. 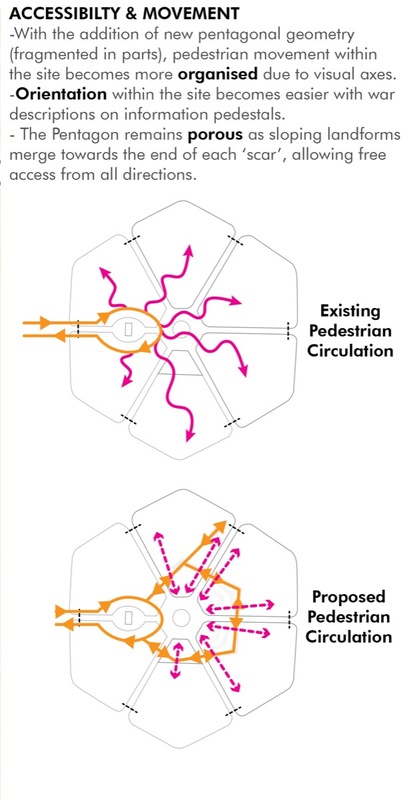 6 sided polygon: Hexagonal geometry through roads / axes being formed around The Canopy. 5 sided polygon: Pentagonal geometry being formed through four new vertices / scars of memorial, with India Gate being perceived as Fifth Vertex of this observed geometry. 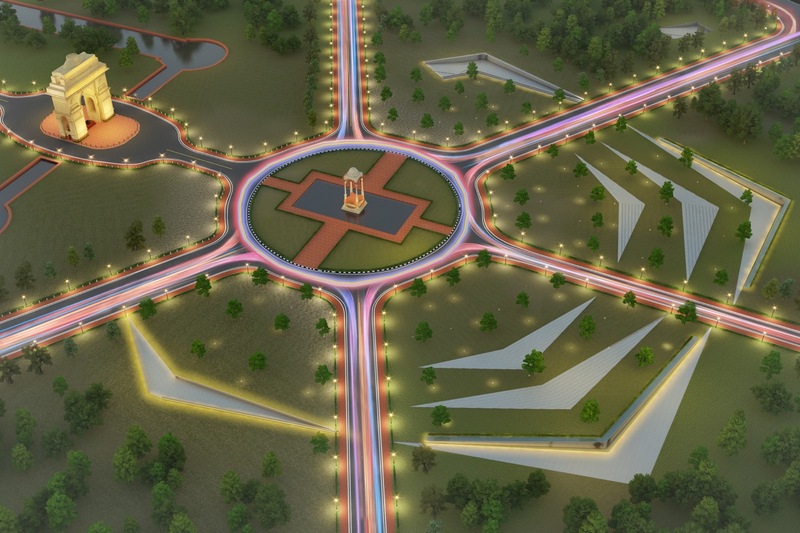 India Gate Complex primarily comprises of a Hexagonal road system divided into six equal sectors or lawns. 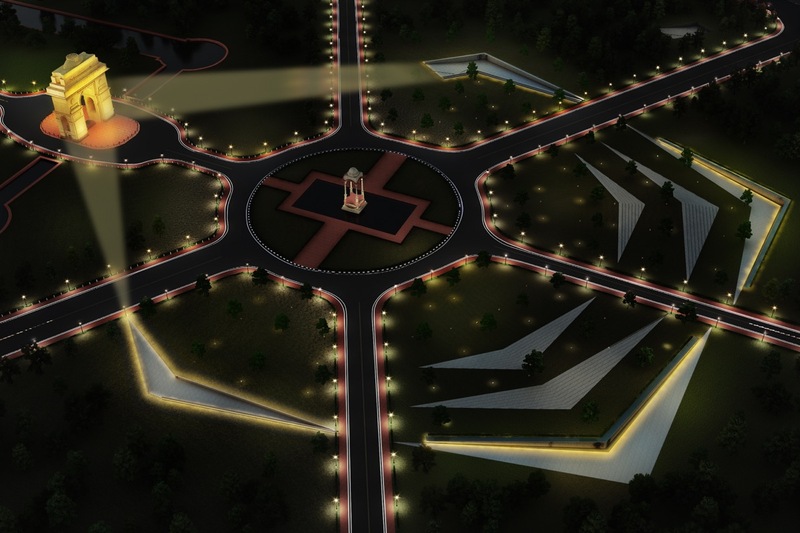 These lawns are landscaped open spaces, gardens & playgrounds separated by six outward radiating roads from the central roundabout where The Canopy exists. India Gate sits astride Rajpath, about 150m west of Canopy. 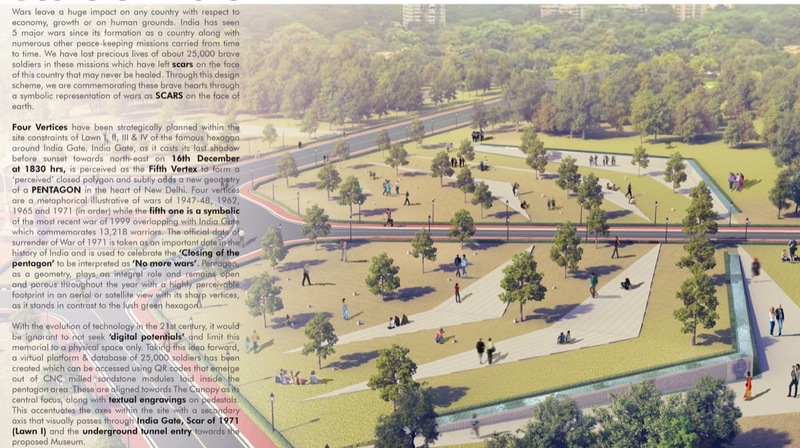 The two lawns on north & south of India Gate (Lawn VI and V), along with Children’s Park in Lawn IV have been left out for any physical intervention. The remainder of site area is strategically used to create the co-ordinates of Four Vertices within the available site. Existing India Gate monument is used as a ‘perceived’ Fifth Vertex of National War Memorial when seen in conjunction with invention elements on site. A new visual axis is also been emphasized comprising of three elements, viz. underground tunnel to proposed museum (Lawn I), flight of steps down to Scar 1971 (Lawn I) and India Gate. At a micro-scale level, landscape and feature elements viz. new (and replanted) trees and pedestal stones with QR Codes (for mobile users) and text engravings (details of wars & peace-keeping missions) are aligned to converge towards a single center point (Canopy) to accentuate the addition of new geometry with visual axes. To commemorate the closing of five wars, two light installations will be placed in Lawn IV (Scar of 1947-48) and Lawn I (Scar of 1971), respectively. Each of these will highlight beams of searchlight towards India Gate to showcase ‘Closing of the Pentagon’ indicating ‘Closing of Wars’ or ‘No more wars’. This will take place in the evening through night of five days, every year to emphasize the importance of closing of wars. Each of the five wars were ended on the following dates, in order. The QR Code Pedestals are multi-functional feature elements made of Sandstone (same as India Gate) through a CNC router (Computer Numerical Control). QR Codes that can be scanned by any mobile device, and widely used in today’s date, will lead to various points of information on a ‘Digital Platform’ for National War Memorial. This digital platform will comprise of an entire database of soldiers, facts and trivia about wars (to increase public engagement and interaction) as well as direct links to government portals associated with wars. This does not limit the proposal to a physical site merely and creates wider opportunities of public engagement and exposure. 50 % of pedestal stones laid inside the memorial are having pre-designed QR codes (each leading to different points on the Digital Platform), while the other half will have engraved textual information about the wars for the general public. QR Code pedestals turn active as sunlight falls on them to create a contrasting shadow (easily scanable during most of the day time owing to the light colour of stone) while during the night, the embedded lights turn on to act as light beams collectively focusing towards the central Canopy. The same stone is also used to collect rain water and join an integrated network of rainwater harvesting system. The ‘Digital Platform’ for National War Memorial can be accessed by scanning any of the QR codes on the site with each leading to different points of information on the digital platform. The platform, as a web portal, will comprise of search directories for soldiers (by name, regiment/ unit, war, year, etc.). Information about each soldier will be linked to a publically available database which will aid government in maintaining digital records. Facts & Trivia about various wars, conflicts and peace-keeping missions will be available on homepage of portal. A red dot indicating ‘You are here’ will help people orient to the Master Plan of Memorial which will promote circulation and interaction within the site. Access to ‘Armed Forces Portals’ (Indian Army, Indian Air Force & Indian Navy) will be through homepage of portal to create more visibility and exposure for these government-run websites. The entire portal will be integrated with latest technologies to collect data that can be collected and analysed by the government for improvement of public spaces in the country.